Justin Long wears black high top Converse “Chuck Taylor” All Stars in the film. Trish and Darry Jenner’s ride home from college turns into a nightmare. Against the advice of Trish, Darry insists on looking inside the culvert. As Trish and Darry drive into the church yard, the camera work is filled with all kinds of symbolism, as you see crows flying, a broken cross, and even the tree branches fluttering with tension. Although Darry shines a flashlight down the culvert, he really can’t see anything, so he insists on climbing in part way, while Trish holds him by his feet. “Just hang on to my feet,” he tells Trish. All you have to do is hold on to my chucks. Suddenly there is a rustling noise, and Darry cries out something which Trish can’t understand, as several rats come running out of the culvert. Trish is so surprised that she lets go of Darry’s feet, and he tumbles into the culvert. When a dazed and scratched Darry recovers from his fall, he finds himself in a strange subterranean cavern. There is indeed a barely alive body wrapped in the sheet, which grabs at him and trys to tell him something. Meanwhile, a frantic Trish yells at Darry to say something to let her know he is okay. 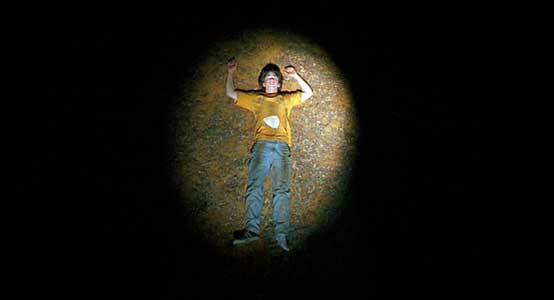 Darry crawls into the culvert, only held up by his chucks. To reveal much more of the story line to Jeepers Creepers would spoil its impact on you as a viewer. As with all good horror movies, the first viewing is the most affecting and disturbing. Jeepers Creepers certainly has its share of disturbing visuals, especially in the following scene which reveals the scope of what the Creeper (Jonathan Breck) has been up to and gives the viewer along with Trish and Darry some idea of who they are up against. Later we are introduced to the indifferent townspeople in the local town diner/gas station, Jezelle Hartman (Patricia Belcher), a local psychic who seems to know all about Trish and Darry, the deputy sheriff (Barndon Smith) and his partner (Avis-Marie Barnes) who set out to investigate the Jenner’s story, and Eileen Brennan as a cat lady with hundreds of cats on her property. Trish loses her grip on Darry’s chucks when some rats startle her. 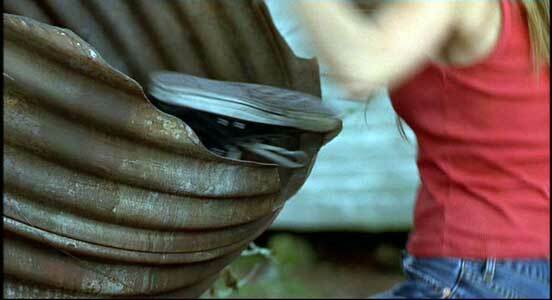 The production values of Jeepers Creepers are worth discussing, because so much thought and care was put into them. The whole production design was done very creatively, although again revealing too much about some of the things that you see would spoil the impact of the film for the first time viewer. Some of the scenery created for this film is pretty incredible and grotesque. (Imagine an amalgamation of the artwork of Hieronymous Bosch, Michaelangelo, and the movie Frankenstein) The whole production crew outdid themselves in some of the set designs, props, photography, and concepts; if this movie was more mainstream, they would definitely has gotten nominations or awards for their creative efforts. Many kudos to cinematographer Don E. FauntLeRoy, makeup and creature effects design supervisor Brian Penikas, visual effects supervisor Bob Morgenrot, production designer Steven Legler, art director Kevin Egeland and set decorator Barbara Peterson. The same is true for the music. While much has been made about the title and its corresponding song, “Jeepers Creepers,” as being the clue to the film, that may only be true on one level. The real key to the concept behind this film comes during the final credits, when you hear another thirties song, “Hush, Hush, Here Comes the Bogeyman” that seems to be a better summation of what the film is about. Writer-director Victor Salva’s brother Bennett Salva provides additional original music that helps creates the horrific landscape of the film. Victor Salva’s direction gets a lot out of his relatively unknown cast, and he uses the Hitchcock approach most of the time to build suspense and terror, rather than assualt us with constant gore. His screenplay seems well thought out and full of creative ideas; eventually (as with most horror films) this works against the ultimate success of the film because at the end the story becomes too unbelieveable to maintain a high suspense level and because its tragic dimension overtakes its human characters and sardonic comedy. But when you consider the quality of production values and story line that you get for the usual horror film, if you like this genre of films, definitely check out Jeepers Creepers. Darry’s fall to the bottom of the culvert knocks the wind out of him. During the fall, one of Darry’s chucks gets snagged on a vine at the bottom of the culvert. Justin Long in his role as Darry wears black high top chucks throughout the film. 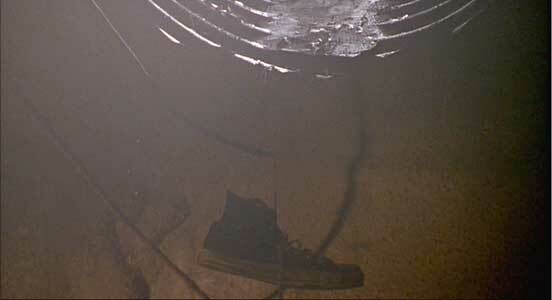 The best chucks scene is the culvert scene, where chucks shots add atmosphere to the scene -- first as Trish tries to hold Darry by his chucks as he peers down the culvert, then you see his left chuck hanging from a vine after it came off during his fall, and later as the camera pans in on a closeup of Darry’s chuck while he leans down to lace it back up after retrieving it, an unexpected drip of moisture falls on the toecap, leading him to another horrifying discovery. 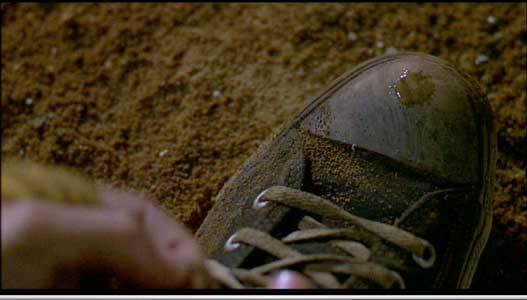 As Darry leans down to lace up his chuck, a drip from above leads him to a horrifying discovery. Jeepers Creepers. (2001) Justin Long, Gina Philips, Eileen Brennan, Patricia Belcher, Jonathan Breck, Brandon Smith. Written and directed by Victor Salva. Category: Horror.